Now's The Time captured two groups who performed at the Three Blind Mice's own jazz festival called "5 Days in Jazz 1974." The first group was the Tsuyoshi Yamamoto Trio with guest soloists Isao Suzuki on cello and Sunao Wada on guitar. They performed two songs on Side A of the original vinyl LP. 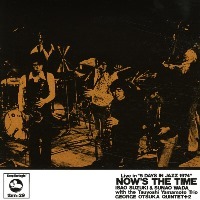 The entire Side B of the LP was occupied by a 26-minutes-plus title track, a jam session by the George Otsuka Quintet augmented by two guest musicians--Yoshio Otomo and Kenji Mori, both on alto sax. This is an exciting live album by the top Japanese musicians who were the stars of the TBM label at the time, with lots of inspired, spontaneous playing. Recorded live at Nihon Toshi Center, Tokyo on March 26, 1974. Blu-spec CD is compatible with all regular CD players. Paper sleeve special limited edition.